With the implementation of the planned closure of collective centres, their number is rapidly decreasing. In 1996 there were approximately 700 collective centres. 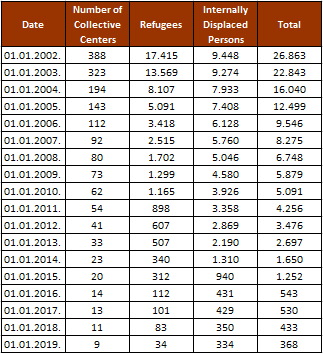 In January 2002, in the territory of the Republic of Serbia there were 388 collective centres that accommodated 26,863 persons. As of January 01, 2019, in the territory of the Republic of Serbia there are 9 collective centres accommodating 368 persons. Of these 9 collective centers, 1 is in the Republic of Serbia excluding Kosovo and Metohija and accommodate 68 persons. The remaining 8 collective centres are in the territory of Kosovo and Metohija and accommodate 300 persons. In 2012 8 collective centres were closed: KC "7. juli" in Zemun, KC "MDEKS" in Kragujevac, KC "Predrag Devdžić", KC "Moštanica" and KC "Vrtogoš" in Vranje, KC "Motel Kamping" in Bujanovac, KC "Hotel Ineks Krajina" in Negotin and KC "Čardak - Deliblato" in Kovin. In 2013 8 collective centres were closed: KC "Žiča" in Kraljevo, KC "Stara ciglana" in Vlasotince, KC "Hotel Romulijana" in Gamzigradska Banja, KC "Građevinar" in Kaluđerica-Beograd, KC "Dom zdravlja" in Leposavić, KC "Ratko Mitrović" in Požega, KC "Kolare" in Jagodina and KC "Venji breg" in Zubin Potok. In 2014 3 collective centres were closed: KC "Šilovo-hladnjača" in Gnjilane, KC "Šatorsko naselje" in Kraljevo and KC "Dečiji vrtić" in Bujanovac. In 2015, 3 collective centers were closed. In Smederevo - CC "ОRA Radinac", in Kladovo - CC "Karatas", and in Rača - CC "Karađorđev dom". In 2016, 3 collective centers were closed. In Vranje - CC "Rasadnik", in Kragujevac - CC "Dečje odmaralište Trmbas, in Belgrade-Palilula - CC "PIM Krnjača" and in Gadžin Han OŠ "Vitko i Sveta". In 2017, 2 collective centers were closed. In Bela Palanka - CC "Hotel ES i Remizijana" and in Bujanovac CC "Stara Ciglana". In 2018, 2 collective centers were closed. In Pancevo - KC "CENTAR TO" and in Sabac - KC "Varna OOCK". In collective center "Hotel ES i Remizijana" - Bela Palanka there are currently 26 persons returnees by the agreement on readmission. Throughout the years the Commissariat for Refugees and Migration of the Republic of Serbia is implementing programmes for sustainable solutions and has been investing great efforts to provide durable solutions and local integration of refugees and internally displaced persons. The Commissariat implements programmes for the establishment of durable solutions in cooperation with numerous EU and international agencies and organizations, governments of individual states and local self-governments. Израду веб-презентације подржао је Швајцарски државни секретаријат за миграције (СEM), у оквиру пројекта "Подршка систему управљања миграцијама у Републици Србији 2016-2019."